Recently, I’ve been looking at OLPC News in a whole new light. I’m seeing it as more than just a blog. In fact, when you bring in the OLPC News Forum and how both integrate with the OLPC Wiki, I see a three part system that is the community of practice around the One Laptop Per Child program. A community of practice is a group of people who share a common passion for a subject and through regular interaction and communication, improve their knowledge and expertise in the topic area. Communities of practice differ from teams and networks in that they are bound by a shared desire to learn, and implement the learning through practice. 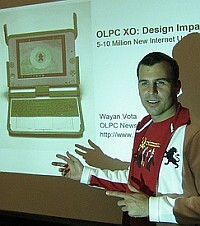 When you look at the success of OLPC News in being an independent source for news, information, commentary, and discussion of the “$100 laptop” initiative, with almost 900 posts and 10,000+ comments, you quickly realize that there is a massive exchange and interpretation of information at all levels of ability. Add in the 3,200+ members of the OLPC News Forum and their 25,000 posts and you realize the conversation is greater than any single domain. 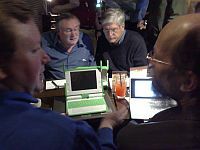 Yet, there is not other platform where OLPC insiders like Walter Bender and Mary Lou Jepsen to technology visionaries like Lee Felsenstein and Steve Cisler, to the many thousands of interested and committed supporters can express their thoughts and hope to change others (and their) minds as equals. From the beginning of the One Laptop Per Child initiative, the OLPC Wiki has been the supreme knowledge resource and official knowledge repository for the OLPC community. With sections managed by OLPC directly, yet an open architecture that lets the community publish its own learning’s, the Wiki has grown organically to be the final arbitrator of fact from fiction, even if those facts first came from OLPC News instead of OLPC itself. Even better, community members have made the direct link between the wiki and OLPC News & Forum. Wiki pages have developed directly from OLPC News posts or Forum conversations, and the Wiki also drives new thoughts and ideas for posts and conversations. One of the best examples is How Laptop delivery Breaks, where an OLPC News reader, using the OLPC News Forum to collect and analyze data from the community, created the best known knowledge base around a major OLPC issue. From the feedback I’ve received since the inception of OLPC News, I am confident that the conversation on it and the Forum, combined with references to the Wiki, has educated thousands of OLPC supporters on everything from the need for a defined implementation plan, to the actual costs of the OLPC program, to the steps to add Ubuntu on the XO laptop. In the process, the level of conversation has also increased, with basic questions giving way to investigative reports on deployments and intense debates on the basis of education itself. A dozen writers, at least 50 contributors, and countless commenters spread across the globe – few even know real names or have seen photos of each other. Yet every single one of these people considers themselves an OLPC supporter in one way or another. This is what OLPC News, Forum and the OLPC Wiki have created. User groups from Washington DC to Vancouver, each with on and offline activities that forge inter-personal links and informal support networks that reinforce the online community. In fact, participation in OLPC News and Forum has created such strong identities for several participants, they are now recognized experts on topics they once led in obscurity. Personally, my identity with OLPC News has led to opportunities and employment I once thought well beyond my reach. And that is the whole purpose of a community of practice – to improve your knowledge and expertise in a topic area of interest through regular interaction and communication.